Based on a computer game, Need for Speed is of course entirely preposterous, but none the less enjoyable for that. Breaking Bad star Aaron Paul plays Toby Marshall, a garage owner and participant in illegal road races. After he serves time for a crime he did not commit, he is determined to expose the true culprit, his old college rival Dino Brewster (Dominic Cooper). In order to do so (although it is never clear exactly how this will help), he must take part in the De Leon road race organised by “The Monarch”, some sort of video jockey played by Michael Keaton. The race itself has a £2 million prize for the winner, although quite how The Monarch has not attracted the attention of the law for organising an illegal race is also a question left unanswered. But never mind – the key thing is that Toby has only 45 hours to drive across several states in order to participate. Any road trip worth its salt has to be made by a mismatched couple, of course, at which point enters Julia (Imogen Poots). She is a posh-speaking English rose who Toby initially disdains, until he discovers that she has petrol running through her veins. The two of them head south at breakneck speed, with the police in pursuit (as movie law dictates), not to mention Dino’s henchmen. 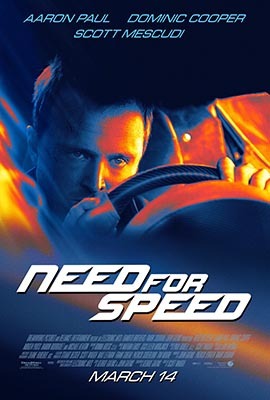 In essence, Need for Speed is a series of races and chases stitched together by a plot that barely makes sense, and populated by comic book characters with V8 engines for brains. The whole thing is ridiculous, and for the first twenty minutes or so I thought I had made a mistake. However, once we got past the point where Toby is released from prison the film really started to take off for me and I was able to relax and enjoy it. In fact, it is fair to say that the more ludicrous things get, and the wilder the action, the more the film succeeds as a piece of pure popcorn entertainment. Yeah, I’m usually not a stiff with movies as dumb as this, but I could handle only so much stupidity, as well as engines revving. Nice review.